Summer is always a busy time at Oak Crest and this year we are teaming up with the Monrovia Public Library to present Innovation Station workshops. 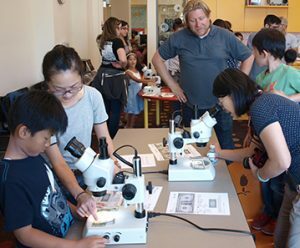 On June 28, we invited local students to bring their parents into the library and examine dollar bills under light microscopes and black light, and show their parents the meticulous care and artistry that goes into making the different denominations of bills. Everyone agreed that they knew more about our currency after checking it out in our workshop.